Hi everyone! Today's post has been a long-time coming. 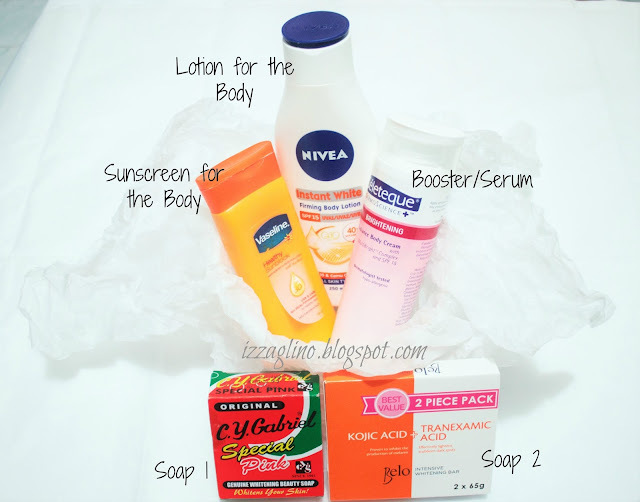 I've never really shared my skincare routine ever in the blog and even in my YouTube channel. I have readers who send request message to share what regimen I use but as much as I want to blog about it I'd either forget or procrastinate. So now that I have fully organized my stuff and even wrote down my current skincare routine in my Bullet Journal I think I am ready to spill how I keep my skin clearer, fairer and even! 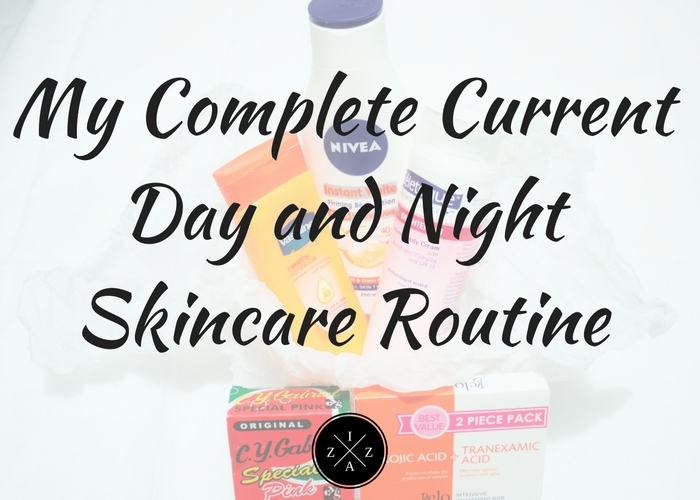 These are my current day and night, face and body skincare routine. No idea until when this practice will last. 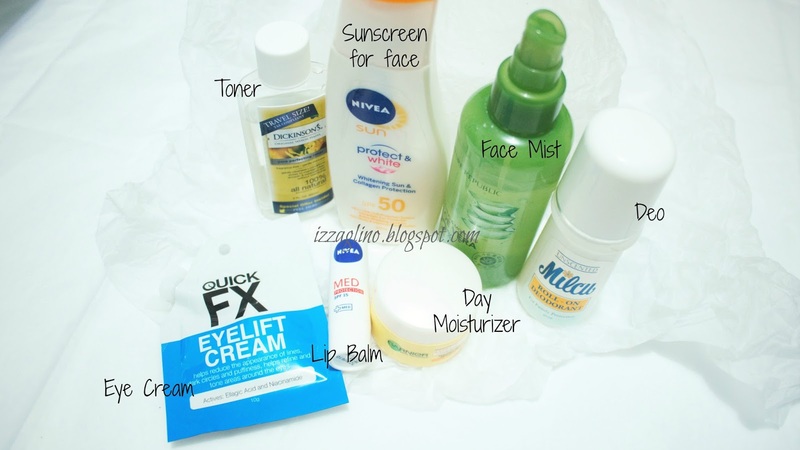 My face skin type is oily with uneven skin tone. My body skin type is dry on some areas and uneven skin color. You may notice that most products I use have brightening/whitening ingredients. I am in no way ashamed of my morena skin. Its just that I have very uneven skin tone plus childhood scars I want to even out. Belo Intensive White Soap Kojic Acid + Tranexamic Acid - I did an intensive review about this you can read HERE. I first encountered the product January last year and I love it so much. When I did my review I was already on my second box because it melts easily which is a downside I found about this Belo Intensive White Soap. This soap also has a tendency to be less effective after your second bar. Nahihiyang ka na. Celeteque Brightening Body Cream. This is actually a new product I tried for my body. I use this as a serum/booster for the body. I like how concentrated the body cream is though its not cheap to be honest. A bottle will last you good for a week and a half only. Nivea Instant White Lotion. After 2-3 minutes that the body cream is in my body I put a lotion. This Nivea Instant White Lotion is part of what I bought during the Big Nivea Sale. It is an okey lotion and I just finishing it up. I'll most probably go back to the original blue one next time. Vaseline Sunscreen. For my arms and neck which most of the time are exposed to the sun I put Vaseline Sunscreen. REVIEW HERE. Nivea Extra White Repair Face Scrub. This is the current face wash I use and something I also bought during the Big Nivea Sale. What I like most about this product is how it leaves my face squeaky clean after use. Nature Republic Aloe Vera Mist. This product is from My Althea Haul and before I actually don't know how or when to use it. Thankfully I tried spraying it after I tone my face and wow it brings back the right moisture on the face. It also lessen the redness caused by impurity, blemish etc. Garnier Light Complete Multi Action Whitening Serum Cream. This is my current moisturizer/day cream. I actually like it because its very lightweight on the face. 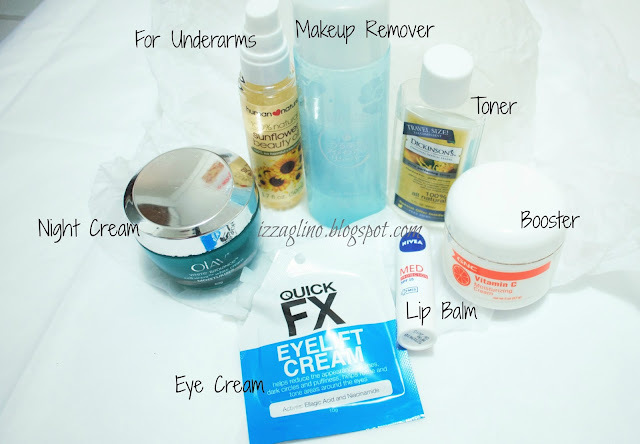 Quick FX Eyelift Cream. I have no idea if this works but considering how puffy and dark my eye bags are I just needed a product to use passionately. Milcu Deo. Favorite deo at the moment. Nivea Med Lip Protection Balm. I love this product because it keeps my lips moisturized. Moist Skincare Mineral Salt. I don't use this on a daily basis but only on my pampering nights. Love how this is packaged conveniently. 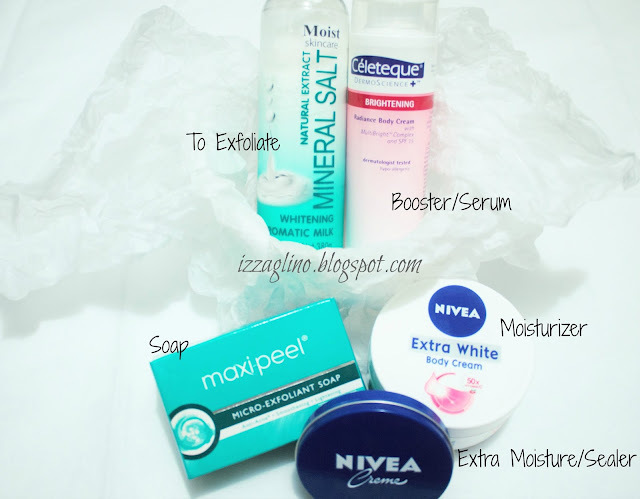 It works well in exfoliating the skin and still leaving it well-moisturized. Nivea Extra White Body Cream. This big tub of Nivea Extra White Body Cream is so special for me. I love using it right after shower when my body is still semi-wet. It absorbs fast on the skin and doesn't feel sticky or greasy at all. Love it! Celeteque Brightening Body Cream. Still use this serum for the body at night as instructed in the packaging. But I make sure to leave 2-3 minutes interval from earlier body cream. Nivea Cream. I know, I know this might sound too much but I love a well-moisturized skin. This thick Nivea Cream seals all the moisture in my body not to mention that its so thrifty to use. REVIEW HERE. Human Nature Sunflower Oil. I use this on my underarm at night since I read a lot of good reviews on how it can prettify the underarm area. So far so good. 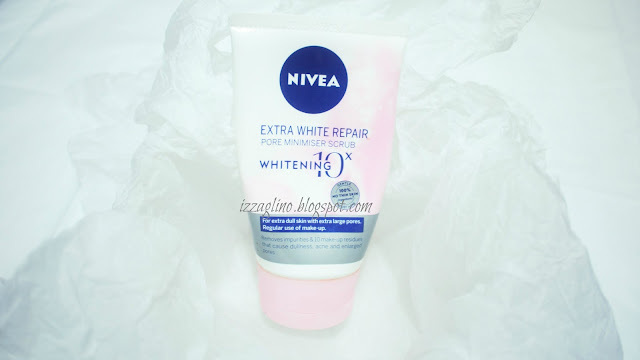 Nivea Extra White Repair Face Scrub. I use a double-cleansing same with the Korean Skincare Routine I made a blog post before. Good to know that this particular Nivea Face Scrub is perfect for makeup removal too. Dickinson's Witch Hazel Toner. Of course we need to tone after cleansing and I still use my witch hazel toner for it. GNC Vitamin C Cream. If you follow me on Instagram I mention that this Vitamin C Cream from GNC has been a big part of my skincare routine. It speeds up whitening process of my uneven skin tone, makes my skin looks healthier and brighter. Olay Night Cream. I am just finishing this tub but after this I'll probably discontinue and not because its not effective... its just that I can't sustain another tub anymore. Its so pricey. Haha. Quick FX Eyelift Cream and Nivea Med Lip Protect. Eye cream and lip balm before bed always. 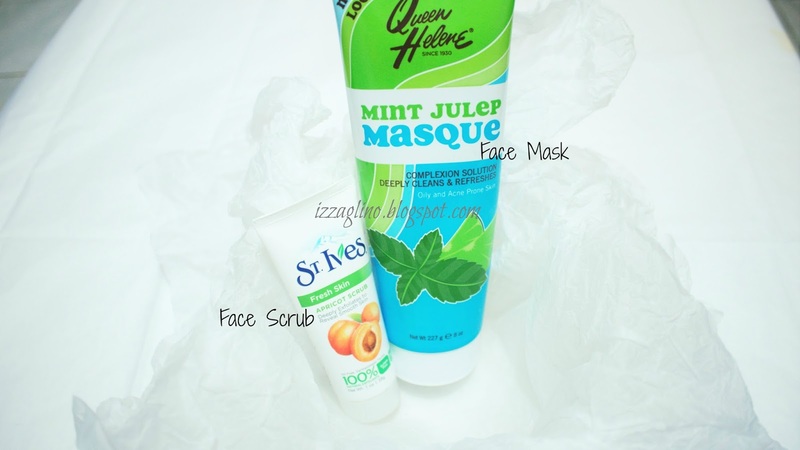 Queen Helene Mint Julep Mask. I super duper love this mask. If only I can use this everyday I'll probably would. I'll give a separate review and step by step instruction soon. Currently I only use this when I feel like my face is dull and needs extra tender love and care. St. Ives Apricot Scrub. Another product I use if ever the condition of my skin isn't that good. Love how this give an instant effect on the face. I know it may seem like I use a lot of product or that my skincare routine lasts super long but actually its not. Once you make it a habit its much faster to be honest. I also enjoy investing in skincare products because I rarely use that much makeup to work. For me a good skin condition is very important. If this post helped you in anyway please comment down below, share this post to others and don't forget to read other articles from yours truly.